Cape Fur Seal (Arctocephalus pusillus), injured by a Great White Shark. False Bay, Cape Town, South Africa. California Sea Lion (Zalophus californianus) with fishing line caught around neck. Los Islotes, Baja, Sea of Cortez, Eastern Pacific. Southern Bluefin Tuna (Thunnus maccoyii), caught in the netting of a fish net holding pen, at a fish farm off Port Lincoln, South Australia. Swimmer Crab (Uncertain species) sheltering in a discarded paint tin. Bali, Indonesia. Within the Coral Triangle. Humpback Whale (Megaptera novaeangliae) - with propellor wounds on back, inflicted by large ocean-going vessel. Queensland, Australia. Classified as Vulnerable on the 2000 IUCN Red List. Volunteers from marine conservation organization REEF count, measure, clean and inspect Red Lionfish (Pterois volitans), an invasive species, caught by divers during a lionfish derby on August 17, 2013 in Palm Beach Shores, Florida, United States. Volunteers from marine conservation organization REEF count, measure, clean and inspect Red Lionfish (Pterois volitans), an invasive species, caught by divers during a lionfish derby on August 17, 2005 in Palm Beach Shores, Florida, United States. Smooth Hammerhead Shark (Sphyrna zygaena), killed by fisherman at the Port Hughes Jetty, Yorke Peninsula, South Australia. Dusky Shark (Carcharhinus obscurus), with hook in mouth. Also known as Black Whaler and Bronze Whaler. Found in tropical and warm temperate seas throughout the world. Photo taken off Florida, USA. 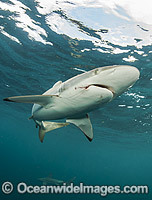 Silky Shark (Carcharhinus falciformis), with hook and line trailing from mouth. Circumtropical species, possibly occasionally venturing into warm temperate seas. Photo taken offshore Jupiter, Florida, USA. Diver with Silky Shark (Carcharhinus falciformis). Circumtropical species, possibly occasionally venturing into warm temperate seas. Photo taken offshore Jupiter, Florida, USA. Sargassum Anglerfish (Histiro histiro), floating on the surface in a discarded polypropylene rope. Found throughout tropical seas worldwide, except east Pacific. Florida Manatee (Trichechus manatus latirostris), showing boat propeller wounds. Also known as Sea Cow. Three Sister Spring, Crystal River Florida, USA. Classified Endangered Species on IUCN Red list. Florida Manatee is subspecies of West Indian Manatee. A sound recording device from the University of Hawaii anchored on a reef off the Big Island, Hawaii, Pacific Ocean. This Green Sea Turtle (Chelonia mydas) has large fibropapilloma tumors on various parts of it's body. Soon the tumors will grow to cover both eyes and limit the turtles ability to locate a food source. Hawaii, USA.